The Lord brought the enslaved Israelites out of Egypt with silver and gold. Trapped by a pursuing army, and Pharaoh who did not keep his word - the Lord parted the Red Sea. The Israelites crossed on DRY LAND, and the Lord closed the sea and drowned the army that pursued them. Before the law was given, though the Lord supernaturaly protected and provided for them repeatedly, the Israelites murmured and complained almost every step of the way. Yet the Lord was always patient and gracious to them, not judgemental. The Israelites were under Grace - not law. But it is interesting to see that the moment Israel boasted in their own strength, God's tone changed. (Exodus 19:8) And they hadn't even heard the law yet! - "Set limits for the people all around, saying: Take care not to go up the mountain, or even to touch its edge. All who touch the mountain must be put to death." - Even their animals would have to die. When we rely on what we can or must do, rather than the truth - that we cannot do it, and need His help - we boast in ourselves. That's called "falling from grace." What happens then? This doesn't mean that we lose our eternal Salvation, it means we squander the "Kingdom Life", and much of our inheritance that brings us peace, joy, power and "life more abundantly." In a word, we lose our "VICTORY!" Don't be "cut off from Christ." Don't let Christ "become of no effect to you." Don't lose your victory, or let satan play keep away with some or most of your inheritance! The sooner you realize how loving and gracious your God really is, the sooner you will stop trying to do what Lord Jesus has already done for you. Then, more and more you will live the "Kingdom Life" that your Heavenly Father and Lord Jesus plan for you! 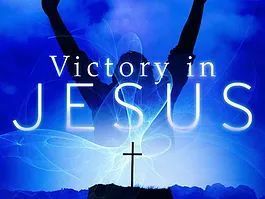 You will walk in Victory! You say you don't know this Jesus? Do you need more info to help you understand what Salvation through Jesus really means? To learn more about His love, and about Salvation, click here.